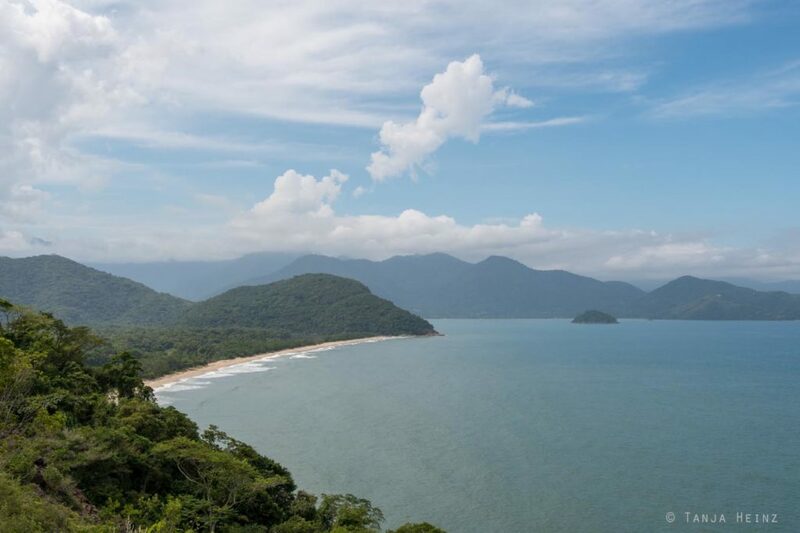 If you are interested in bird watching in Brazil, then Ubatuba in the state São Paulo is definitely a good place to go. 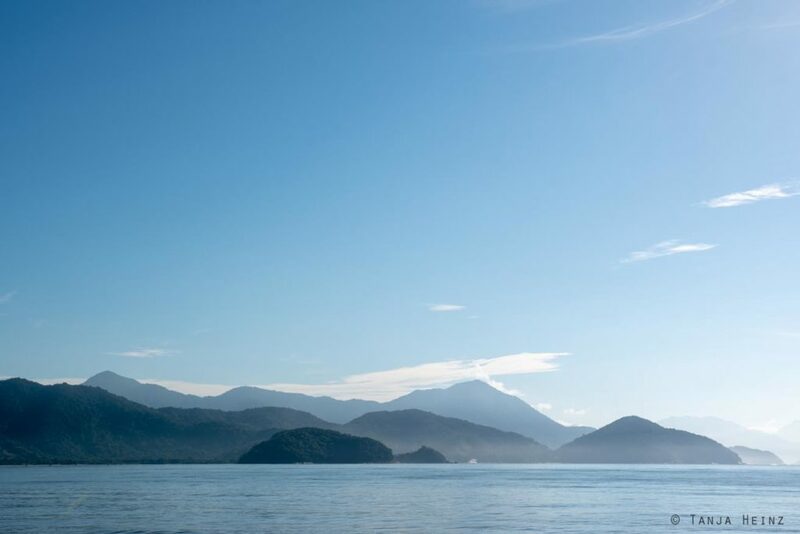 I became aware of Ubatuba when I was looking for more information about the Projeto TAMAR which has a visitor center in Ubatuba. 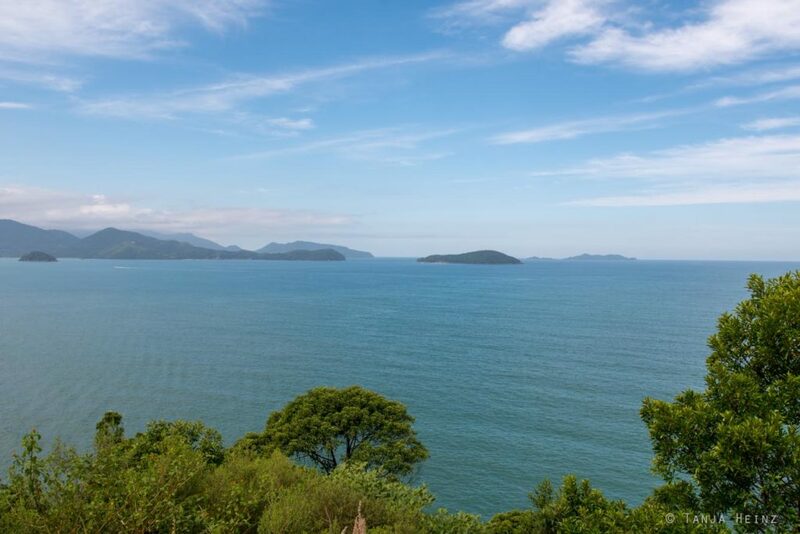 During my research I noticed that Ubatuba is a perfect place for birds, and thus, for bird watching. 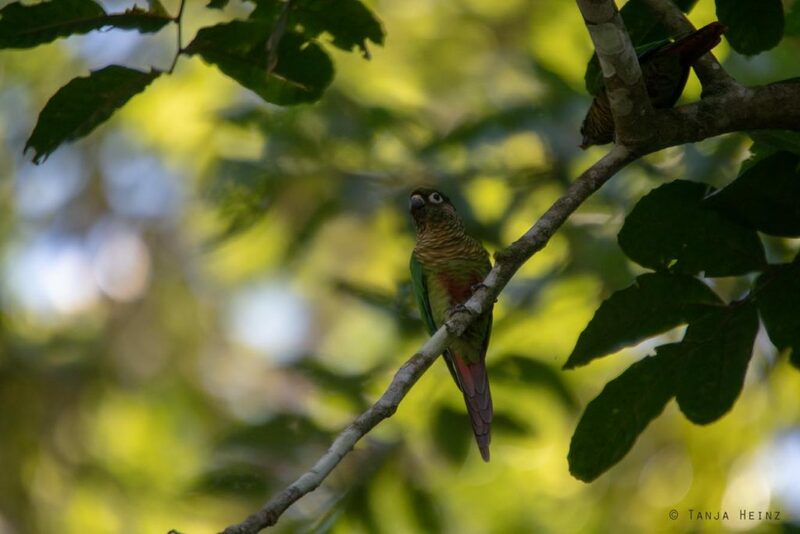 In the Itatiaia National Park we participated in a guided bird watching tour with BirdsRio, but in Ubatuba we wanted to explore birdlife on our own. In retrospect, it was not such a good decision as we took some wrong decisions. More about that later in this article. 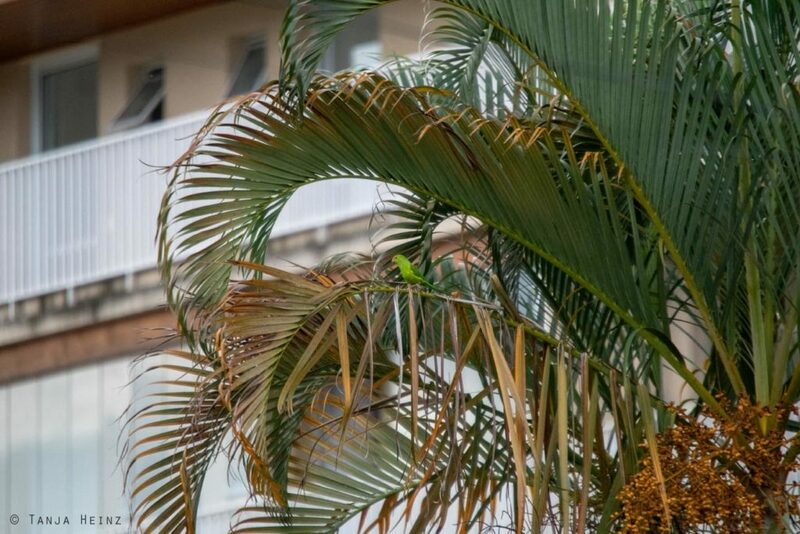 Which birds can you observe in Ubatuba? 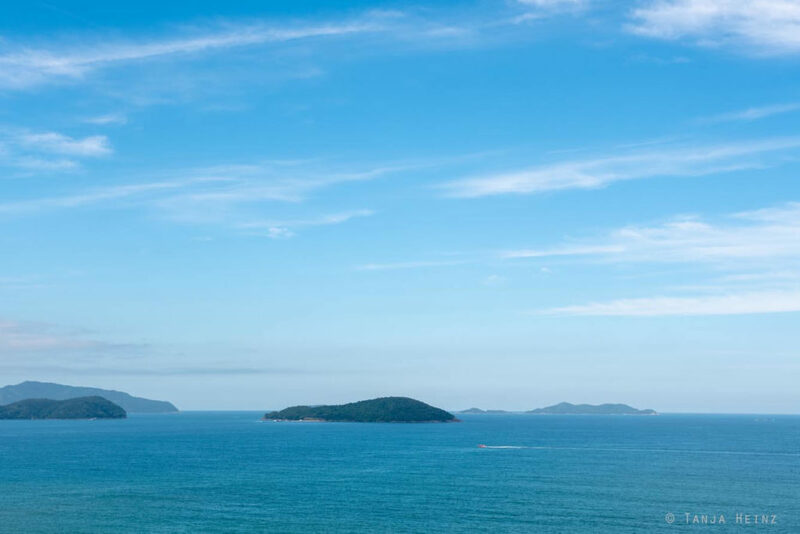 You can find detailed information about birds in Ubatuba and in Brazil in general on the internet website of WikiAves. WikiAves is an interactive internet website which is specialized in Brazilian birds. On this website you will find the best birders of Brazil who are very knowledgeable about Brazilian birds. They help you if you do not know how to determine a bird. I was asking several times the community on WikiAves for help. Therefore, I’m very enthused by WikiAves not only because of its vast information about birds, but also by the community that helps you determining birds. According to the website from WikiAves 504 different bird species are registered for Ubatuba (November 2018). 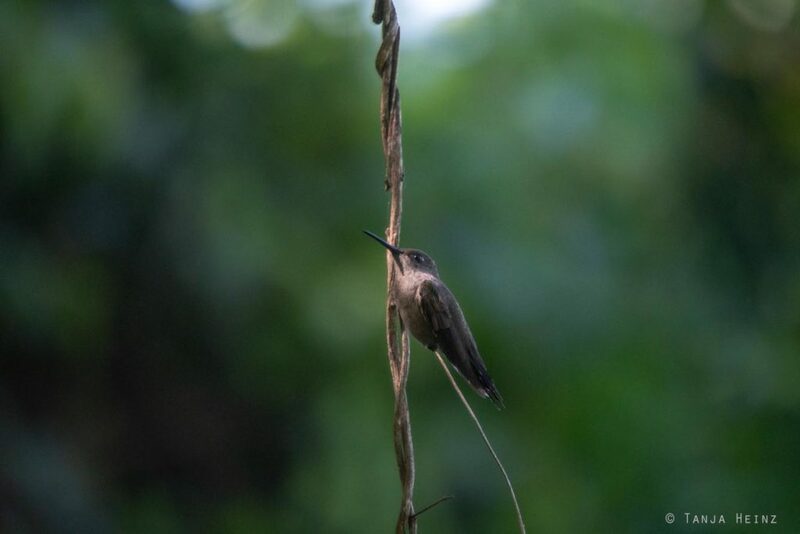 Among those birds are several hummingbirds like the sombre hummingbird (Aphantochroa cirrochloris) or the black jacobin (Florisuga fusca). 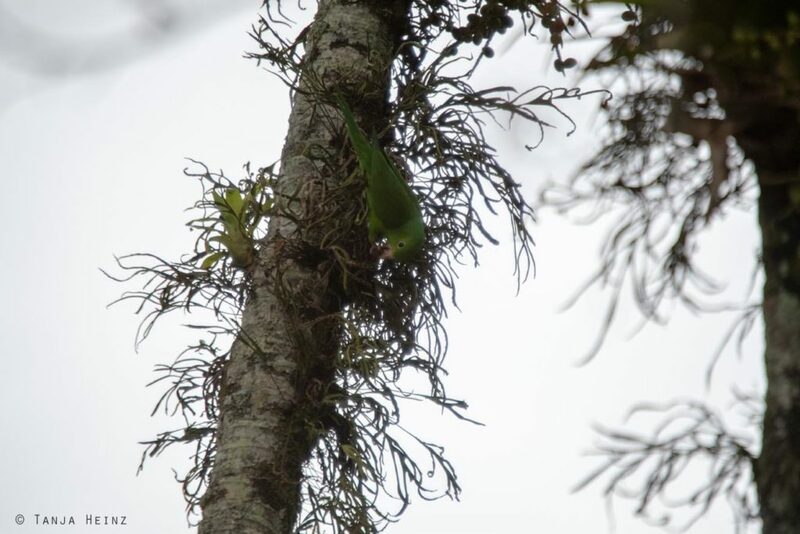 I encountered both of them already in the Itatiaia National Park. 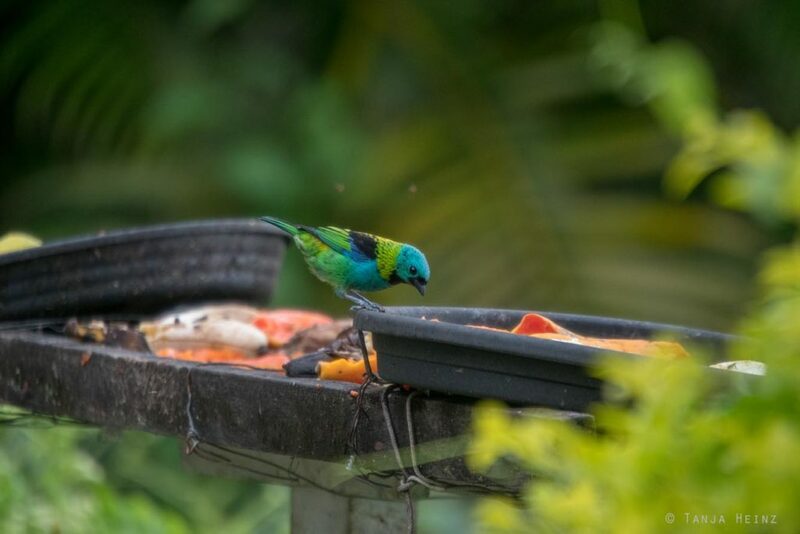 However, I also met several tanagers in Ubatuba like the green-headed tanager (Tangara seledon), the Brazilian tanager (Ramphocelus bresilius), the blue dacnis (Dacnis cayana) or the red-necked tanager (Tangara cyanocephala). Furthermore, there are toucans like the red-breasted toucan (Ramphastos dicolorus), parrots like the brown-backed parrotlet (Touit melanonotus), thrushes like the creamy-bellied thrush (Turdus amaurochalinus), herons like the whistling heron (Syrigma sibilatrix) or the cattle egret (Bubulcus ibis), woodpeckers like the yellow-fronted wookpecker (Melanerpes flavifrons), but also cuckoos like the guira cuckoo (Guira guira). 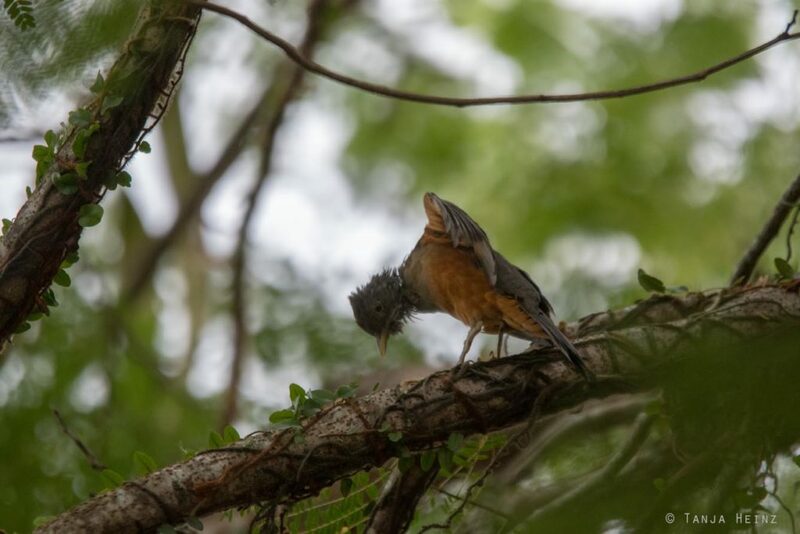 Thus, in Ubatuba you can find a great variety of birds from different bird families. By the way, the blue manakin (Chiroxiphia caudata) is the symbol of Ubatuba. This bird belongs to the family of the Pipridae or manakins, respectively. 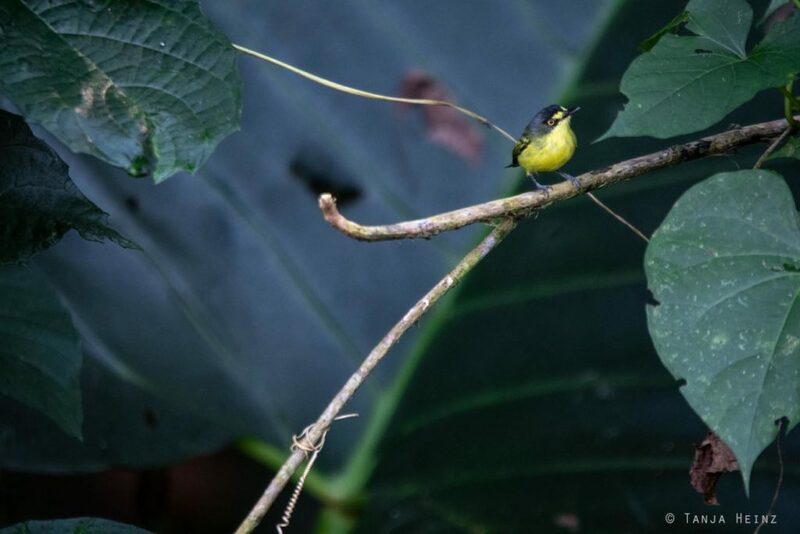 Unfortunately, I could not observe any blue manakin during my time in Ubatuba. However, I met one bird of this species in the Itatiaia National Park as one individual appeared for a short moment in front of my camera. 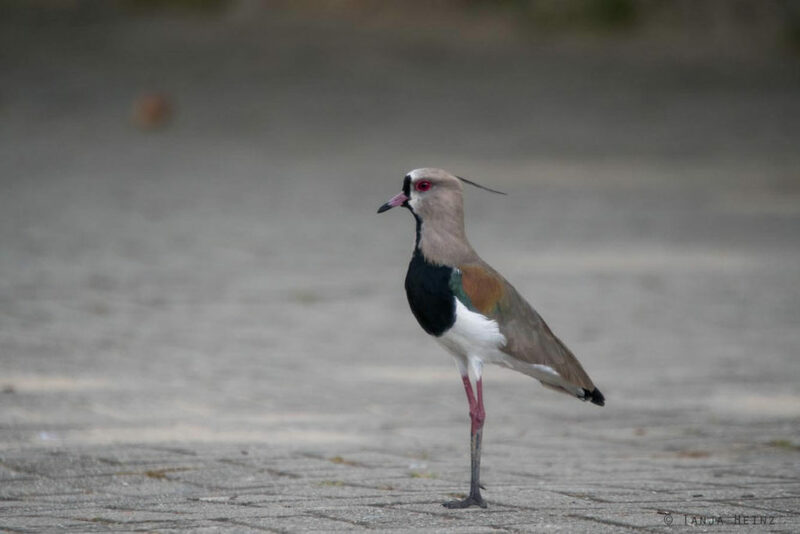 There is another good list of Brazilian birds in the internet. You can find this list on Wikipedia. However, in this list the birds are not organized region by region. 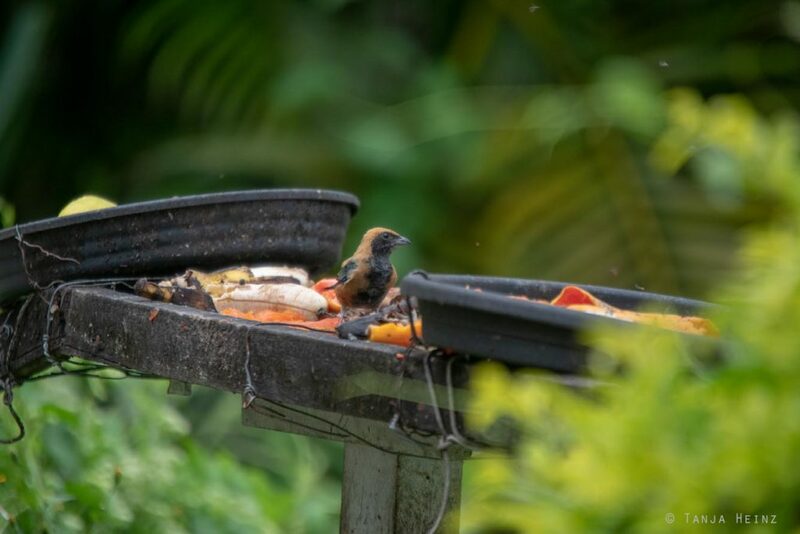 If you want to see a great variety of different birds in Ubatuba, then you should leave the town (although we also observed many beautiful birds in Ubatuba itself). At first, we tried to get more information about bird excursion in the tourist information center. At this information point they recommended us to visit the Centro Cambucá de Observação de Aves which is located close to Ubatumirim. We asked if it is possible to get there by bike and how long we approximately would need. Finally, we started at half past six on the next morning (actually this is already too late for bird watching) in order to cycle to the Centro Cambucá. To come right to the point. We never reached the Centro Cambucá. In retrospect, now I know that it would have been much better to rent a car in order to get to this place. Instead of one hour we needed three hours to get almost to Ubatumirim. On our way to Ubatumirim we met quite many cyclists on racing cycles. Those cyclists might get to Ubatumirim with their racing cycles and fitness in one hour, however, we were not prepared at all for this arduous road. 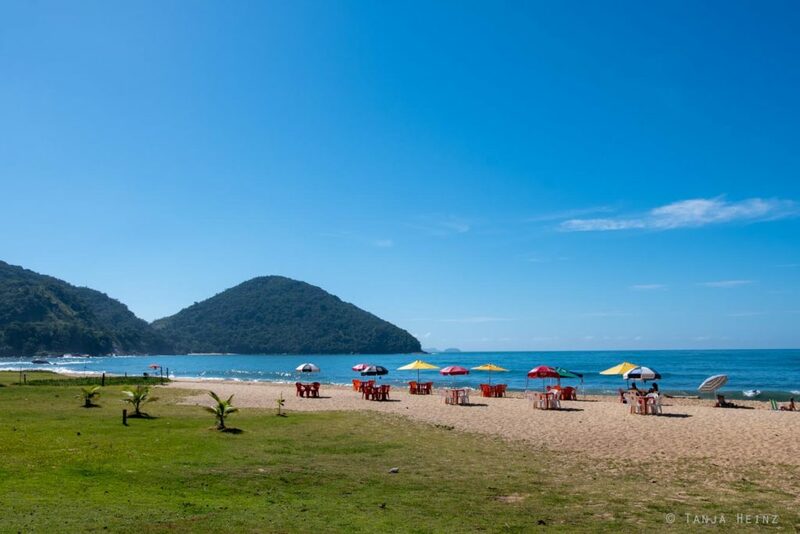 With our bright red heads we decided to head back to Ubatuba. It was already to late for bird watching and the day was already very hot. Furthermore, we observed some people who probably just came back from bird watching. At least they seemed to me like that with their binocular. 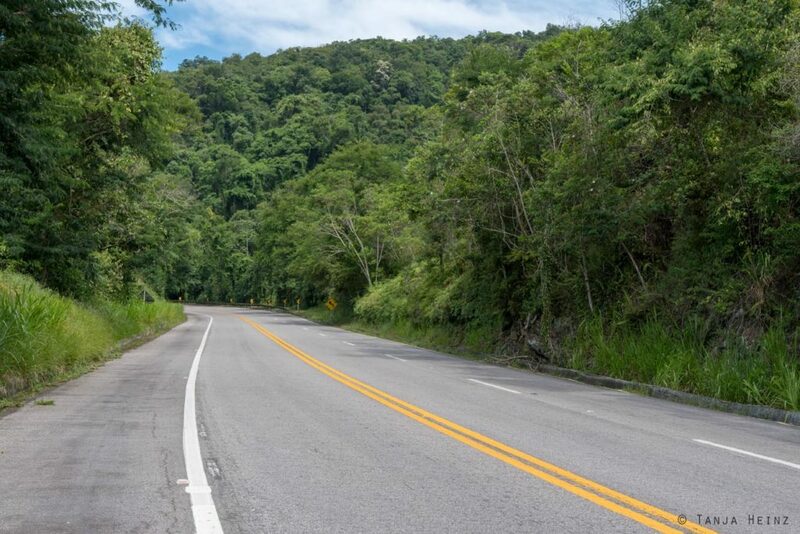 Ubatuba is a great place for cyclists. However, in retrospect it was a wrong decision to go for bird watching by bike to the Centro Cambucá. Thus, our “bird watching excursion” was rather involuntarily a bicycle tour. 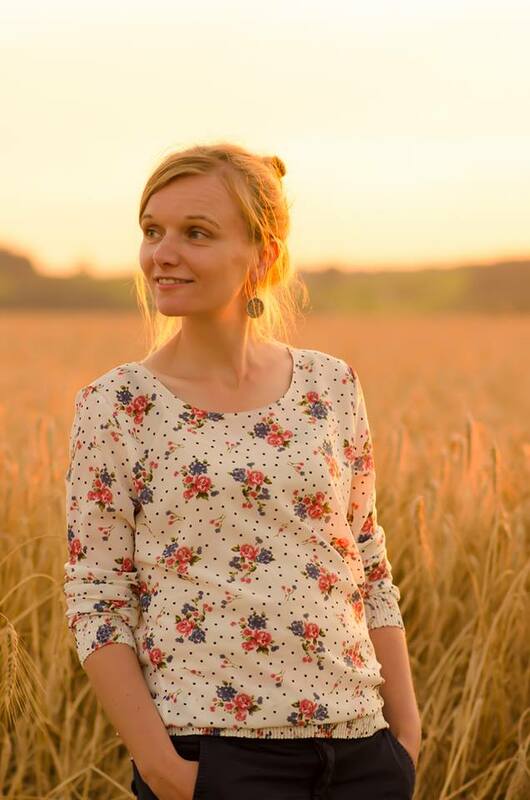 Although we did not go for bird watching, I really enjoyed the landscapes on this tour. When we left Ubatuba our route was still flat. 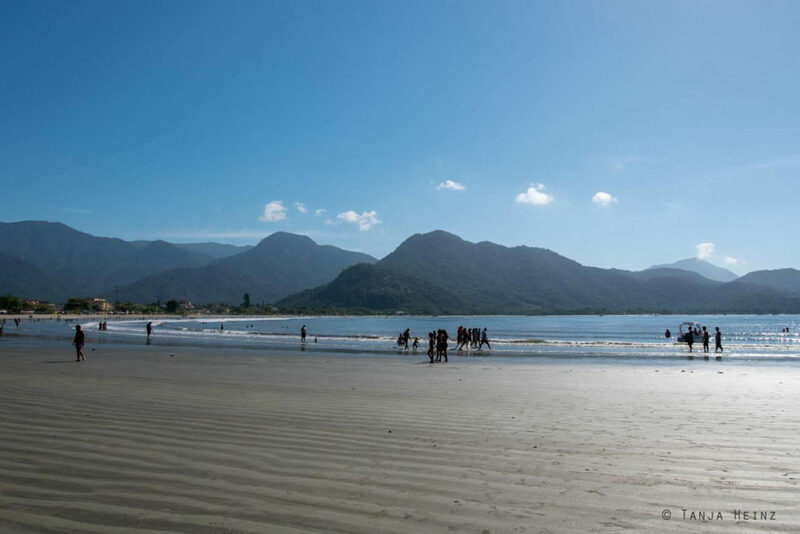 If you leave Ubatuba you will encounter many beaches which are more or less well attended. However, when you further leave the town, the streets begin to steepen. The landscapes on this route were very beautiful. We looked over green hills. Or we had a great view onto the sea. Up the hills we could see the beaches from above. 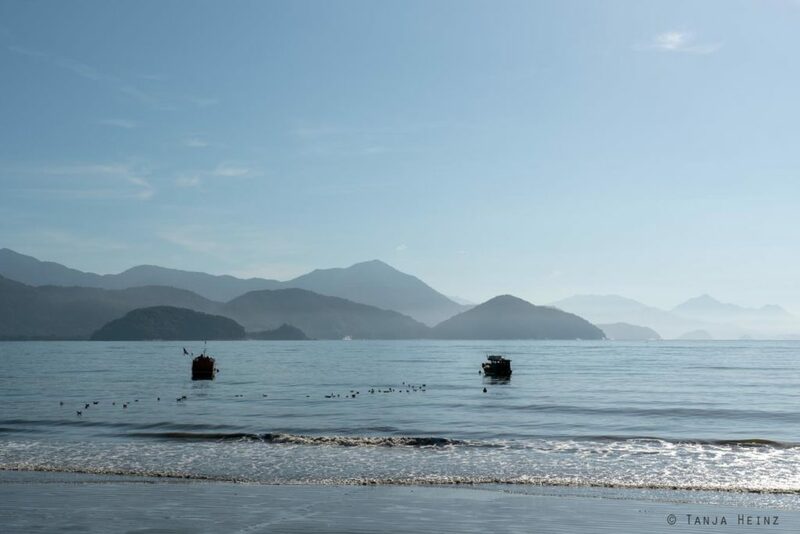 Although I really liked our bicycle tour, I have to admit that I regret a little bit that I haven prepared myself much better to a bird excursion in Ubatuba. 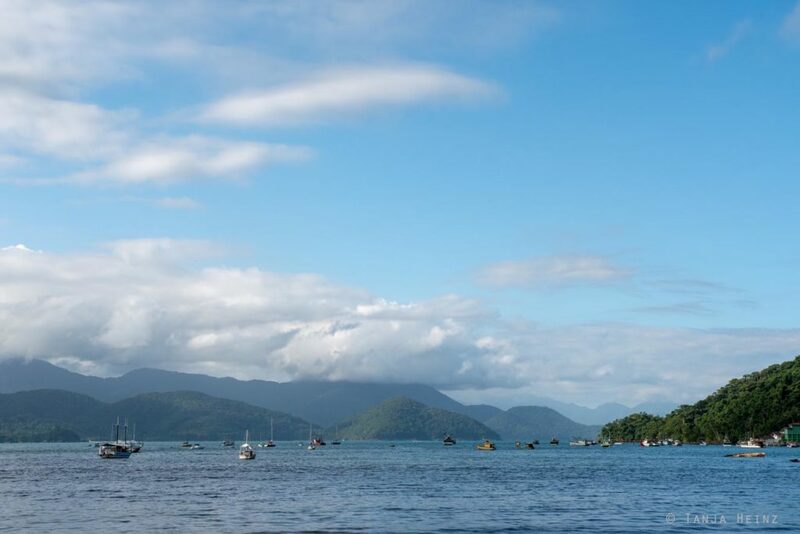 Although it is much better to leave the town for bird watching, you can also see some birds in the center of Ubatuba. 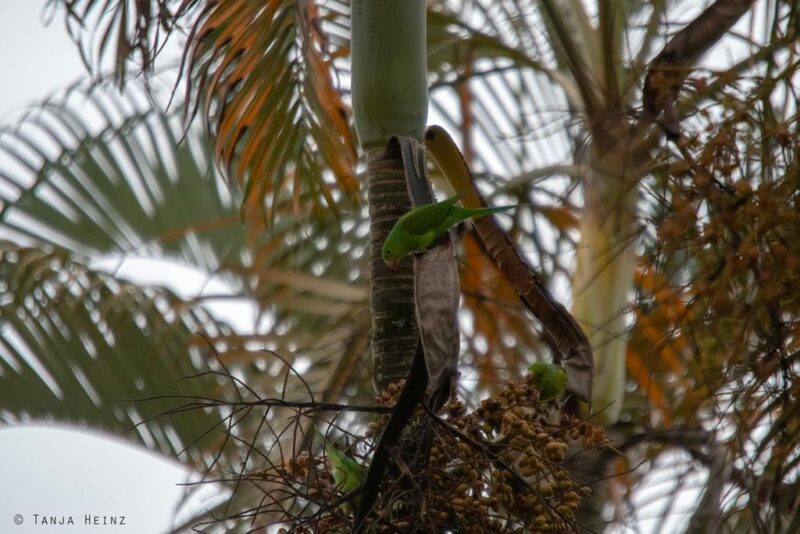 There is one place in Ubatuba were we spotted a bowl of fruits for birds which was prepared by some residents. This place is close to the beach Praia de Iperoig ou Cruzeiro. You reach this place if you pass the bridge close to the beach and turn immediately to the right where you have to walk up a small hill. This place is very calm and there we observed some birds. There was one bird which I can remember quite well. And that was the Brazilian tanager (Ramphocelus bresilius). 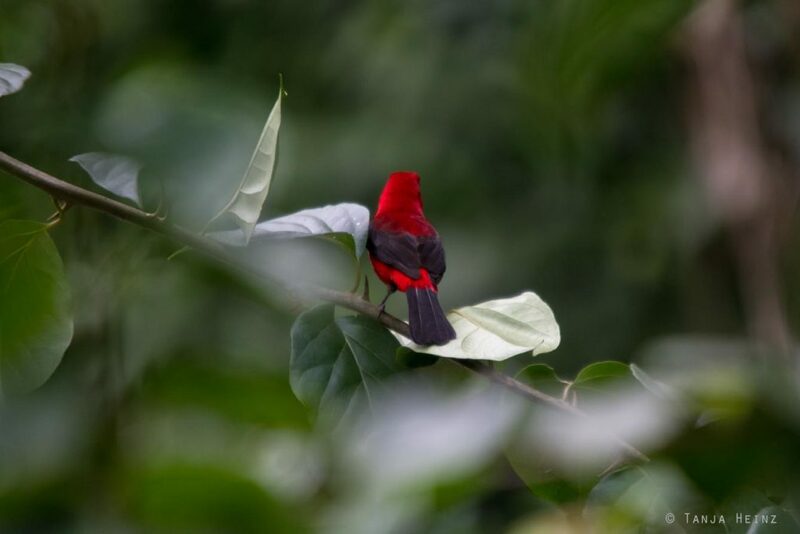 This bird can be recognized quite well by its red coloration and its conspicuous white spot under its beak. However, only males are colored that red. Females are rather brownish or chestnut-colored. Sometimes the Brazilian tanager was perching on a branch almost hidden in shrubs. Where it started to feed on leaves. At the beginning they were quite shy, but later they approached more and more and I could see one whole bird. 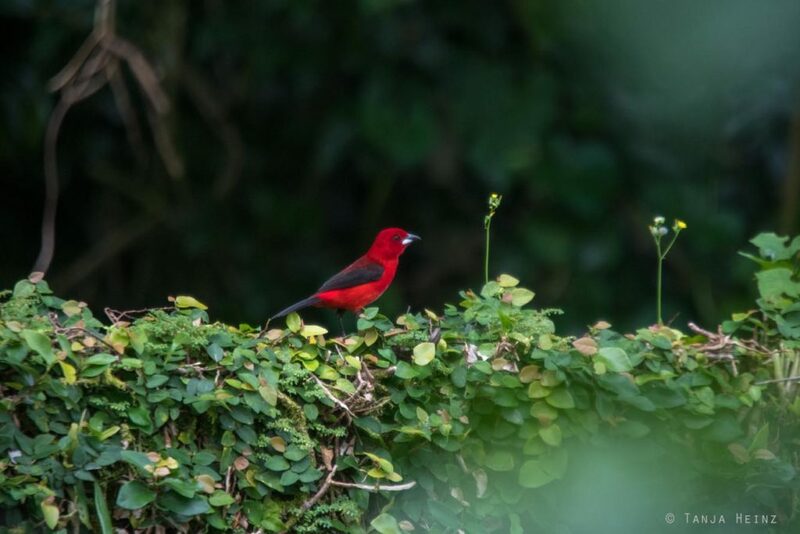 There is one other distinctive feature of a Brazilian tanager. Male of Brazilian tanagers have black wings. But females do not have these black wings. 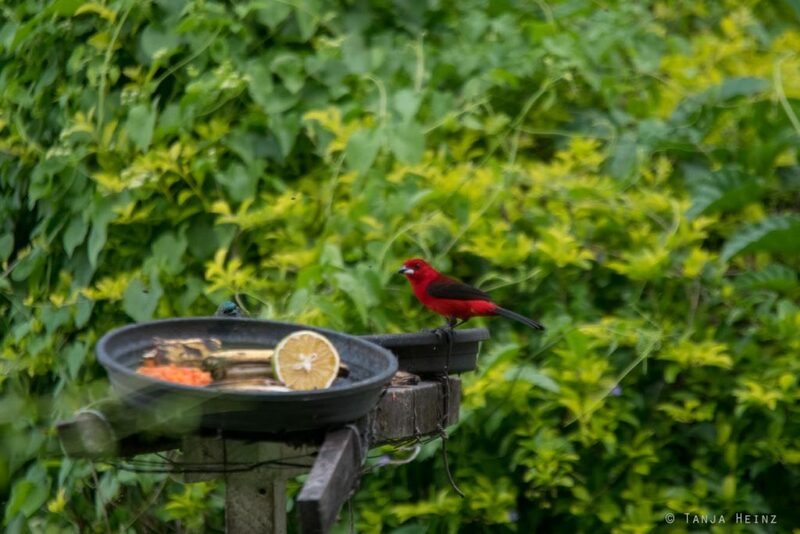 In contrast to other birds, I could observe Brazilian tanagers not that often at the feeding site. But at times they finally came to the feeding site. There was another tanager which was frequently close to the feeding site. And that was a burnished-buff tanager (Tangara cayana). 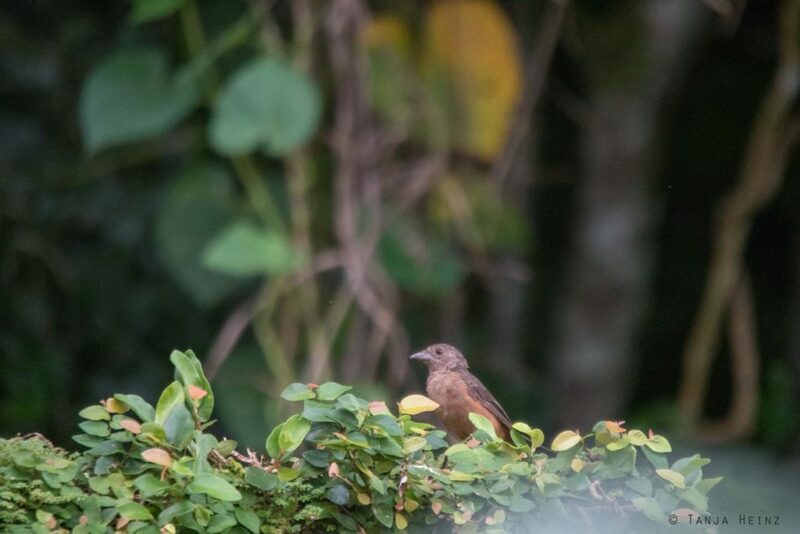 For me it was the first time to see a Brazilian tanager in Ubatuba, but in contrast, I observed burnished-buff tanagers already in the Itatiaia National Park. 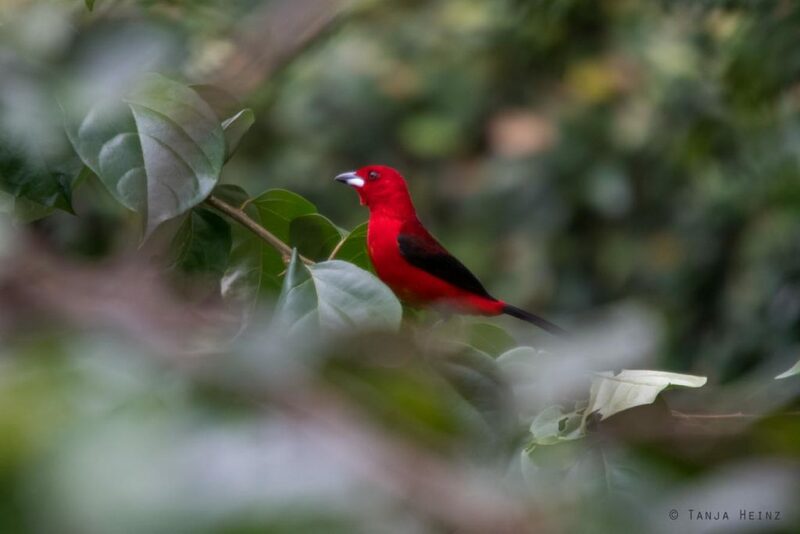 Actually there were two more tanagers I had already seen in the Itatiaia National Park and which came to the feeding site in Ubatuba quite frequently. 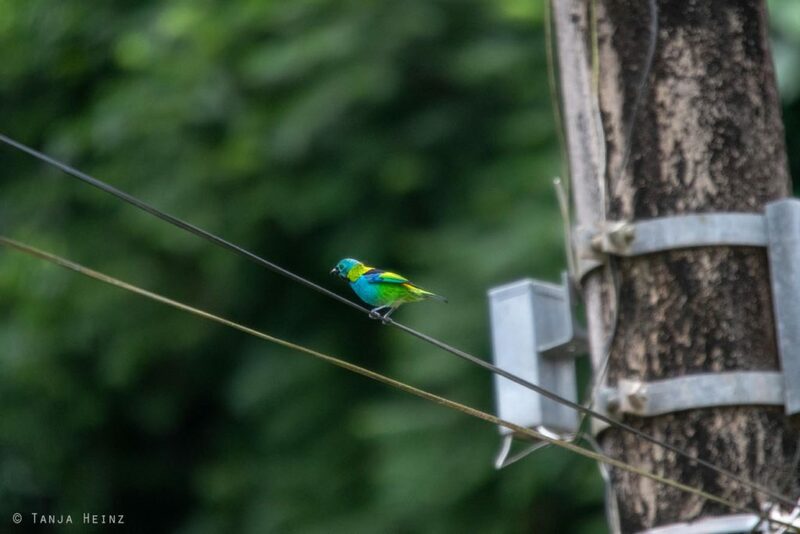 On one site, this was a a green-headed tanager (Tangara seledon). Sometimes they came to the feeding site. And sometimes they were just observing the feeding site. 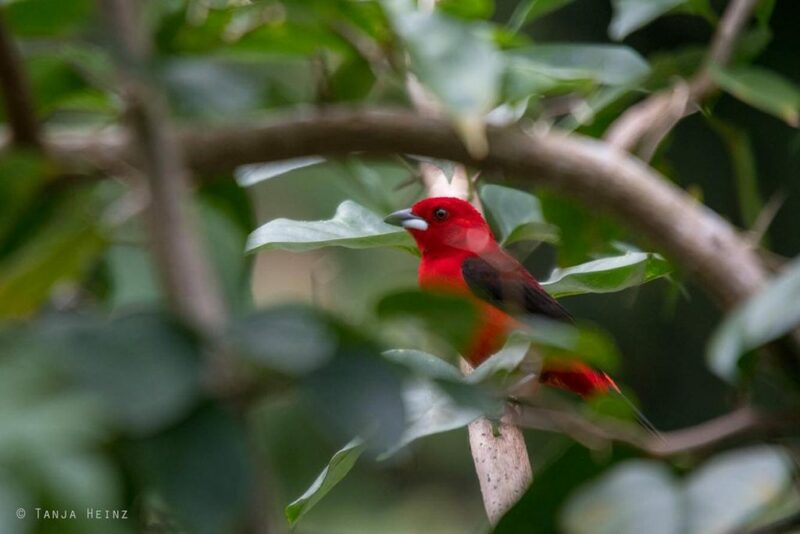 They were not that shy like the Brazilian tanagers. But anyway, sometimes they also vanished into a tree. 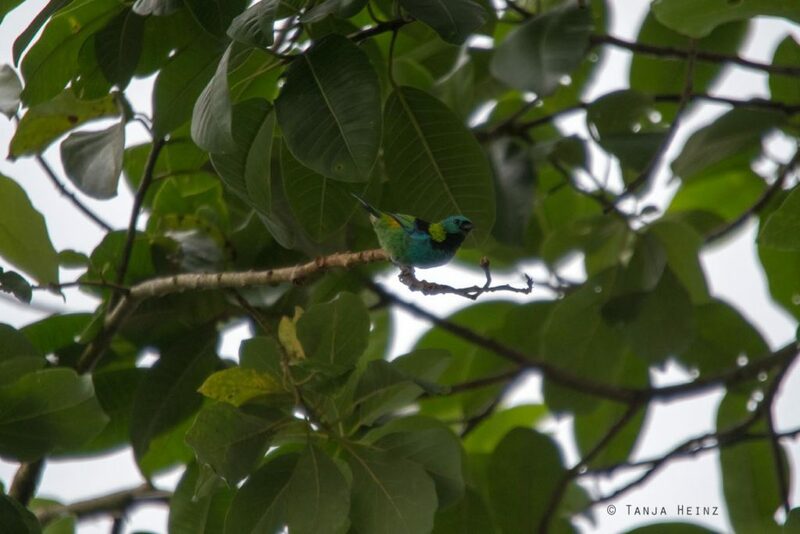 On the other side there were also some blue tanagers (Thraupis sayaca) close to the feeding site. 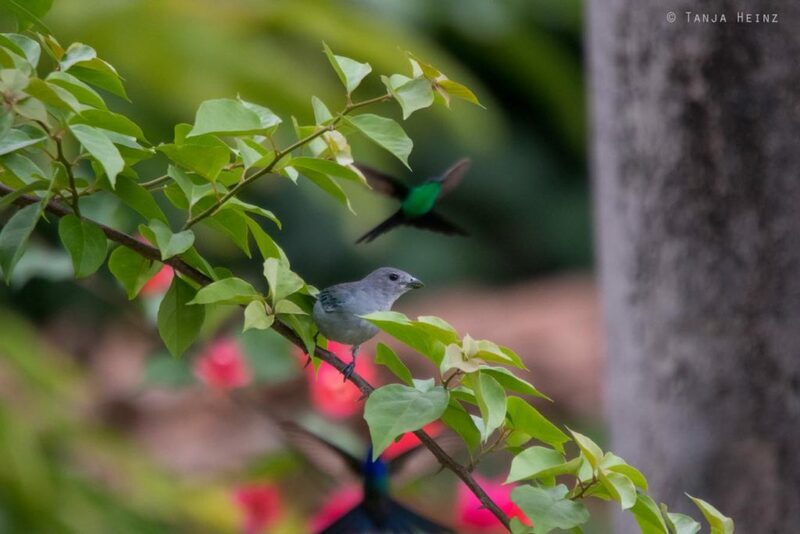 In one moment hummingbirds approached from behind the blue tanager, but they vanished immediately again. Unfortunately the hummingbirds disappeared immediately and I could not find them anymore. Directly at the feeding site I could not observe hummingbirds, but on our way back to the center of Ubatuba I saw hummingbirds twice. 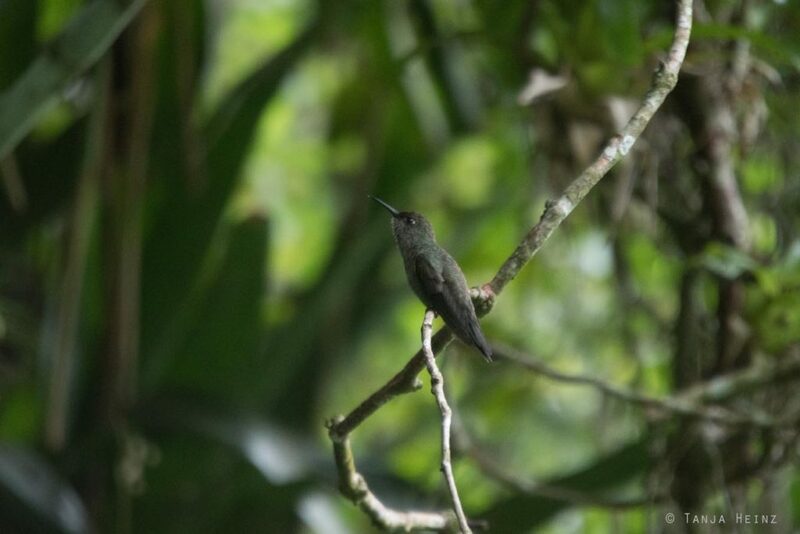 Probably each time it was a sombre hummingbird (Aphantochroa cirrochloris). Of course I also observed at the feeding site birds from one of the most diverse bird family in Brazil. And that means tyrant flycatchers. 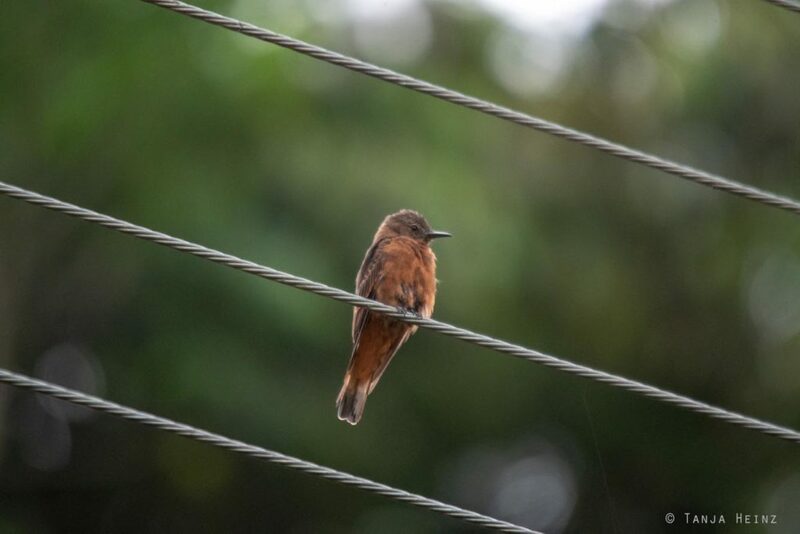 I observed a cliff flycatcher (Hirundinea ferruginea), which I had seen already in the Itatiaia National Park. There was another tyrant flycatcher close to the feeding site. And that was a social flycatcher (Myiozetetes similis). Actually social flycatchers are characterized by a red crown. But from my position under the tree I could not see its red crown. Furthermore, social flycatchers hide their crown most of the time. There was another bird from the tyrant flycatcher family which I found quite pretty. 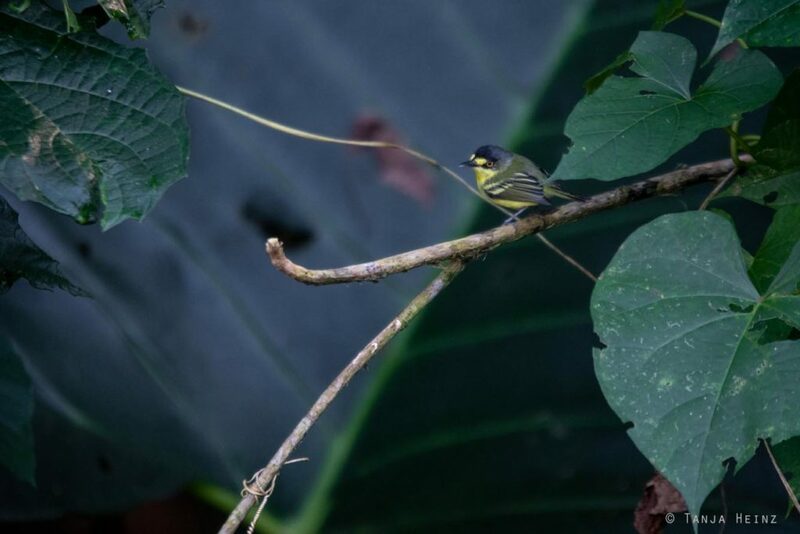 That was a yellow-lored tody-flycatcher (Todirostrum poliocephalum). In one moment the bird showed us its front side. And in another moment its back side. 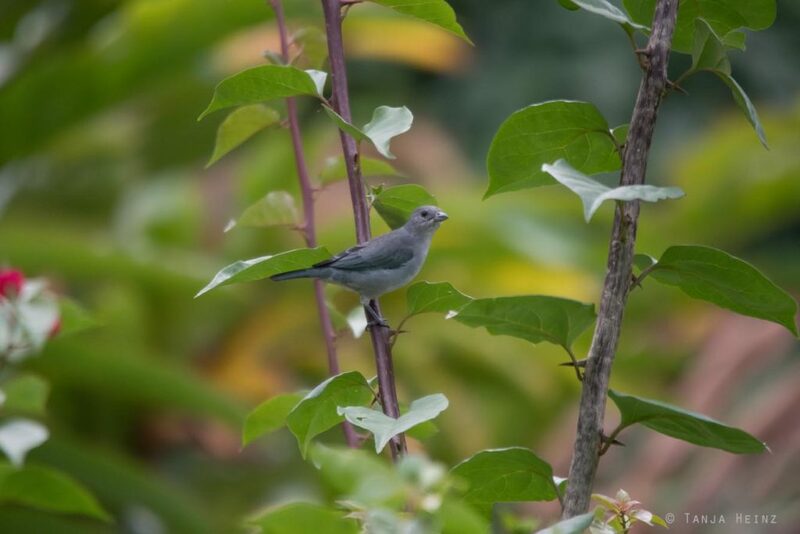 However, there were not only tyrant flycatchers or tanagers to observe at this place. 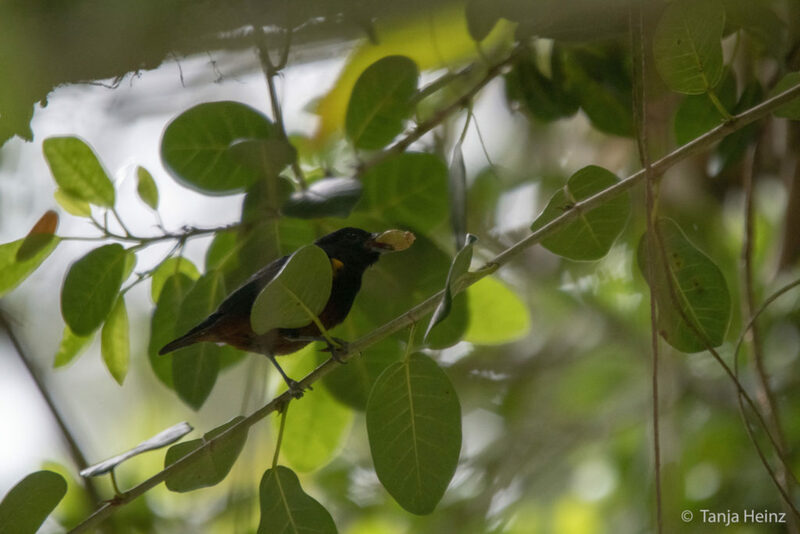 In one of the trees close-by I spotted a chestnut-bellied euphonia (Euphonia pectoralis). But I spotted this bird not at the feeding site. This chestnut-bellied euphonia was almost hidden in a tree feeding on a fruit it had found. Later there was another bird as well almost hidden in the same tree. It was a thrush. 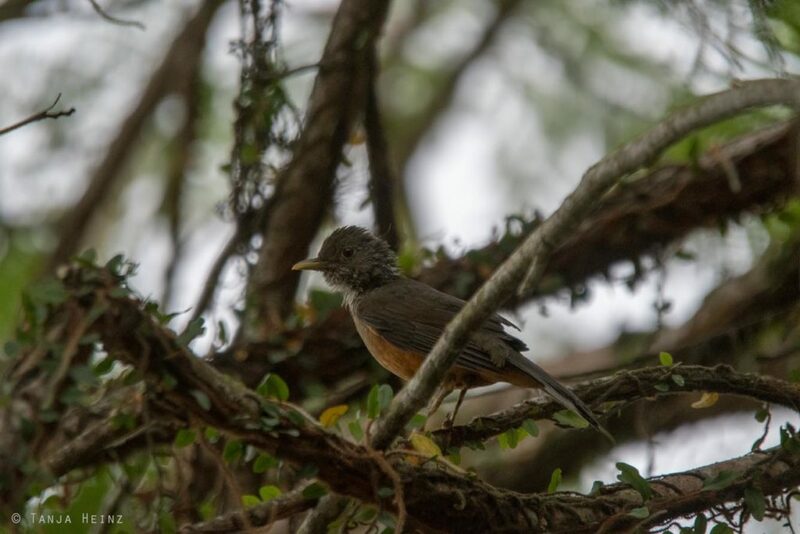 To be more precisely, it was a red-bellied thrush (Turdus rufiventris), which was busy cleaning its plumage. At times the thrush was looking into our direction. 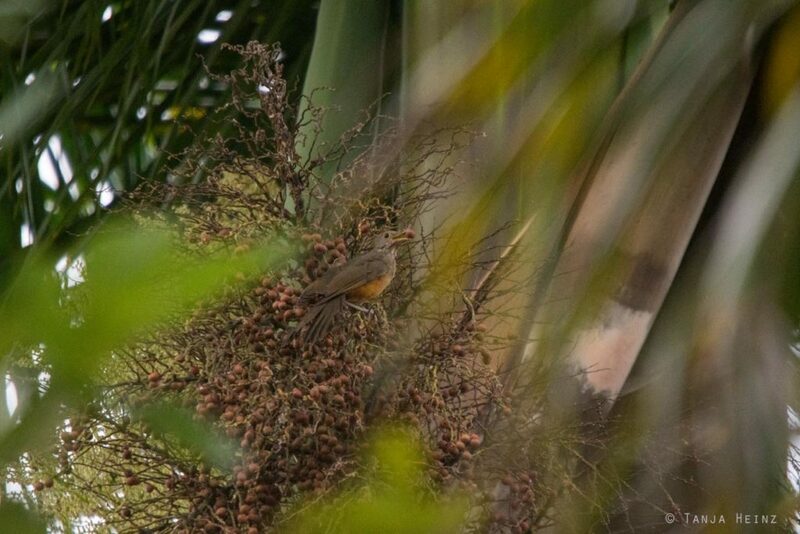 However, this red-bellied thrush did not really care about our presence and it continued cleaning its plumage. When this bird was finished, it left the branch, looked into our direction for a short moment and finally flew away. 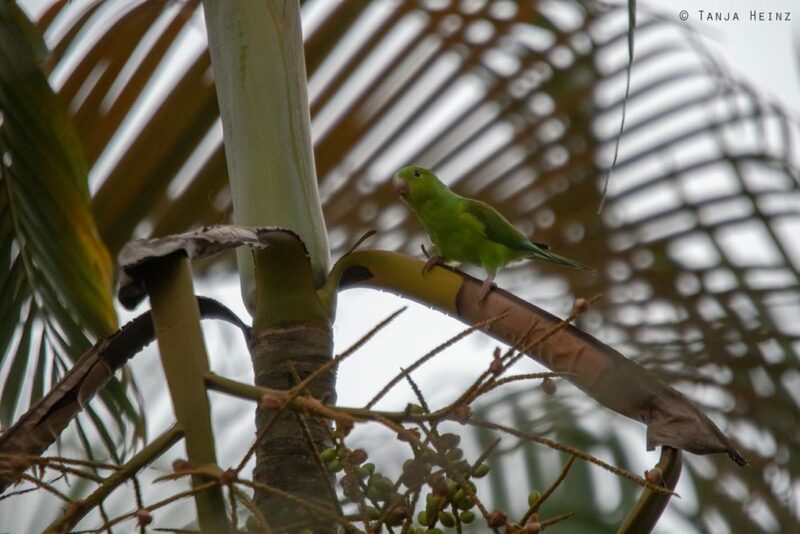 I was especially happy when we met some parrots close to the feeding site. They did not come to the feeding site, but one of them was perching on a branch of a tree. 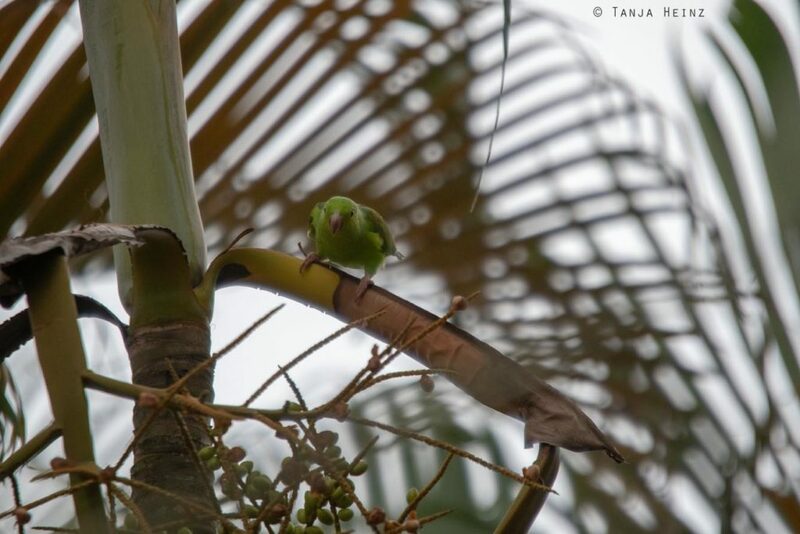 It was a maroon-bellied parakeet (Pyrrhura frontalis). I knew this parrot already from the Itatiaia National Park. 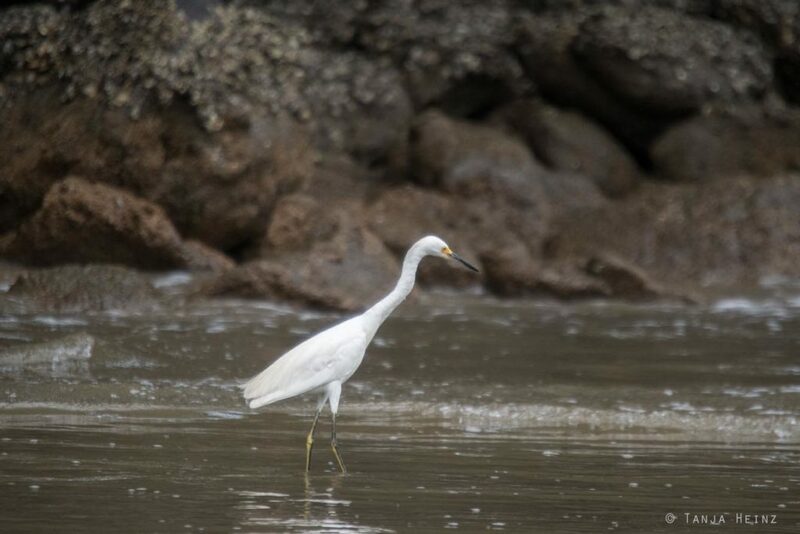 When we left the feeding site, we stopped at a small beach section as we observed a snowy egret (Egretta thula). 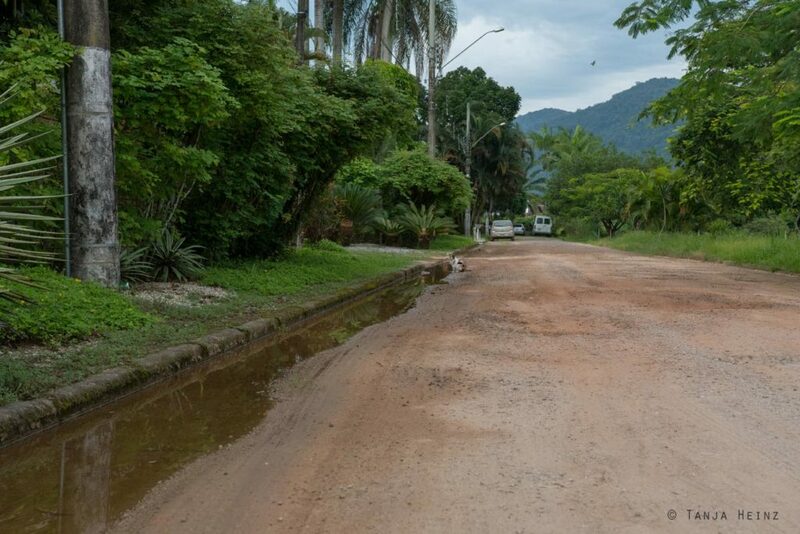 In the center of Ubatuba, that means in the quarter Itaguá we were looking as well for birds. We went attentively through the quarter. 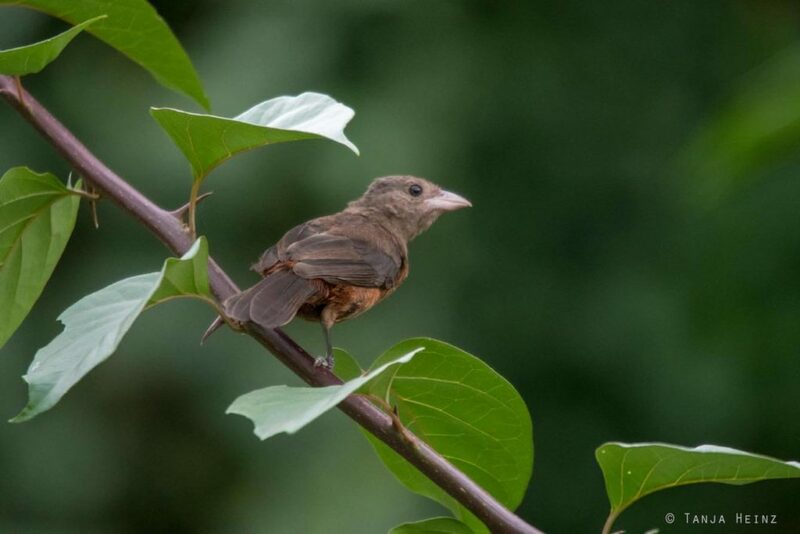 In Itaguá we met one bird that is quite common in Brazil and from the tanager family. 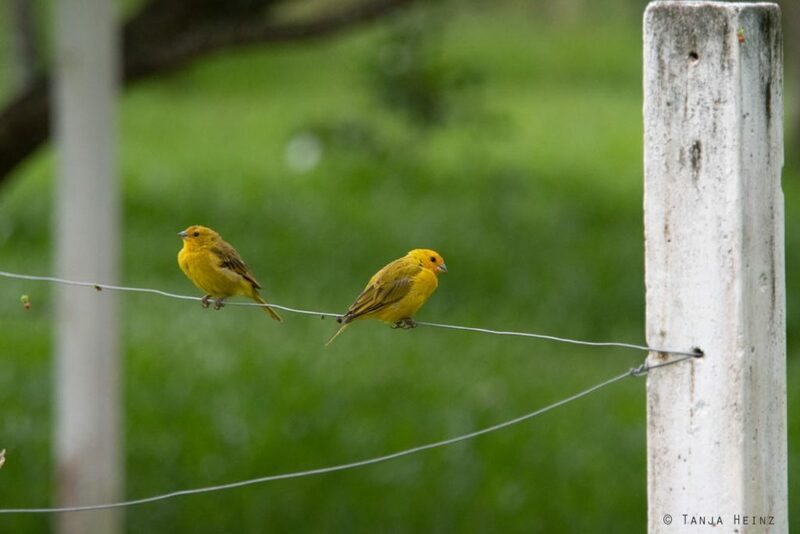 It was a saffron finch (Sicalis flaveola). I knew this bird already from the Feliciano Miguel Abdala Natural Reserve where we were looking for the muriquis, but also from Itaúnas and of course from the Itatiaia National Park. In order to observe as many birds as possible we were looking for birds both on the ground and above us. 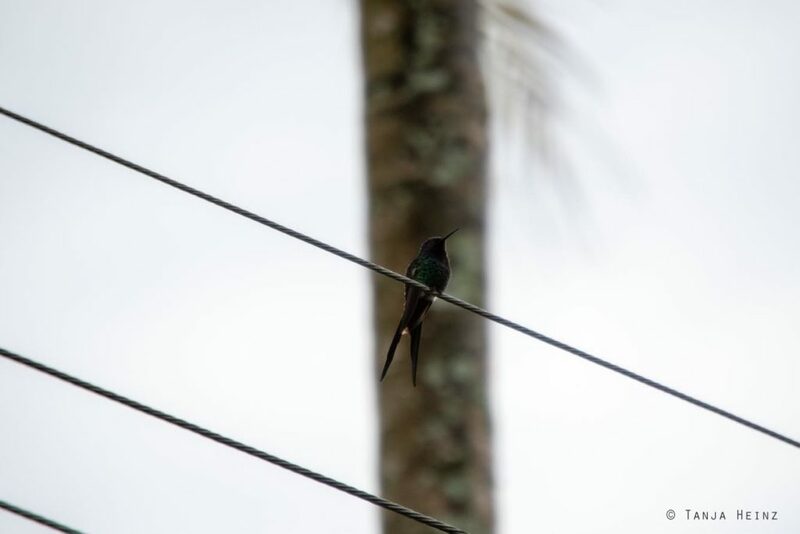 Therefore, we could also spot a swallow-tailed hummingbird (Eupetomena macroura) which was quiet and almost inconspicuous perching on a power pole. However, I observed no hummingbird on the ground. Other birds, in contrast, I did observe there. Among those birds was a social flycatcher which I had seen already close to the feeding site. This time I could look down on its crown. However, even from this position I could not observe its colored crown. It was hidden. 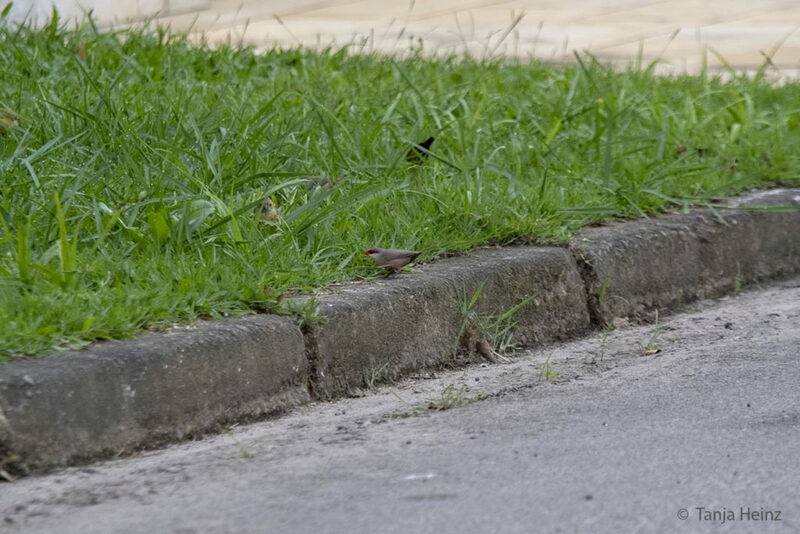 Another bird on the ground was the common waxbill (Estrilda astrild). 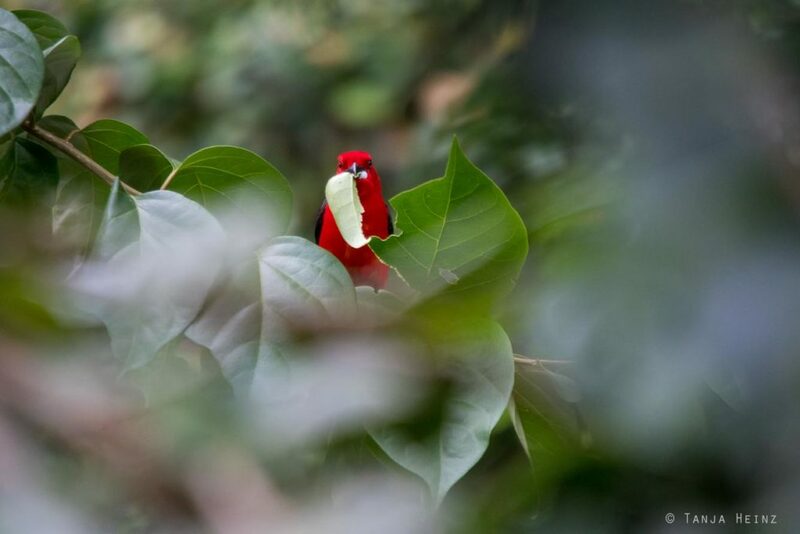 It was a very shy bird, and thus, we could observe it only from a long distance. 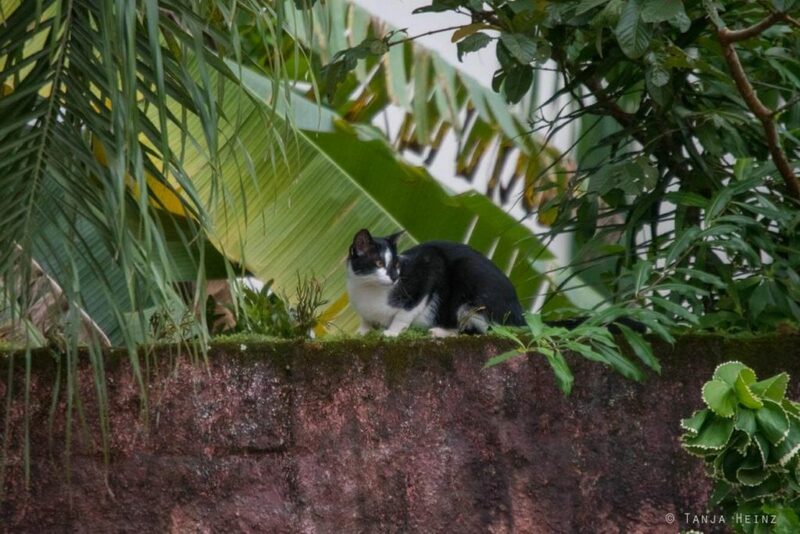 During our walk through the quarter Itaguá we came across some cats. Do cats affect bird diversity in Brazil like for example in New Zealand where many flightless birds live? I cannot answer this question, and thus, I have to leave it unanswered here. To get back to Brazilian birds. 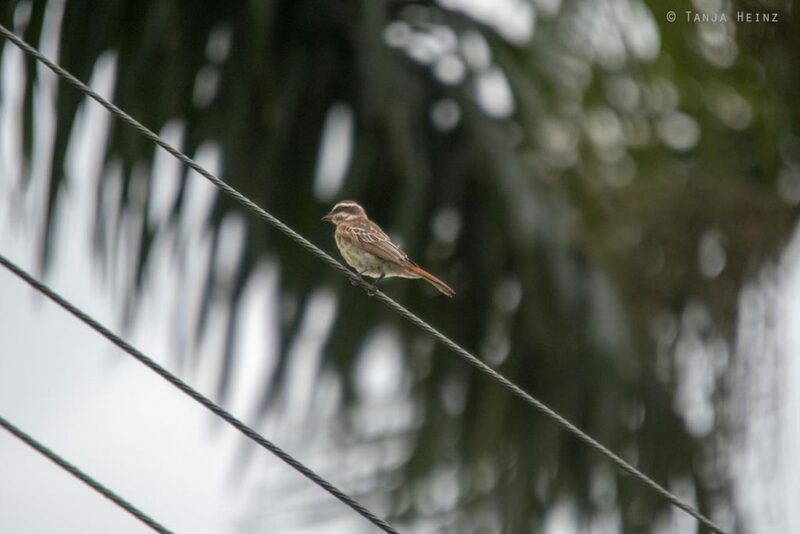 In the quarter Itaguá we saw some more tyrant flycatcher. 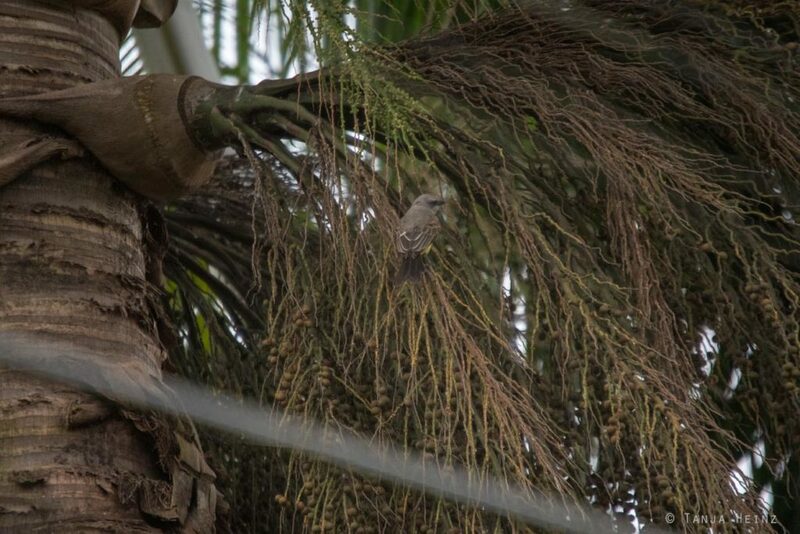 Among them was a variegated flycatcher (Empidonomus varius). 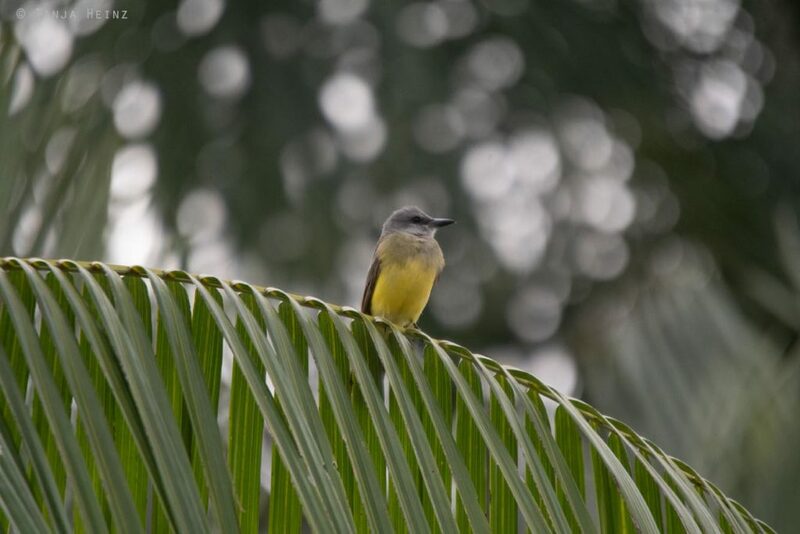 But also a tropical kingbird (Tyrannus melancholicus), which I found quite beautiful how it was perching on a palm leaf. Finally the bird flew away and we left as well. 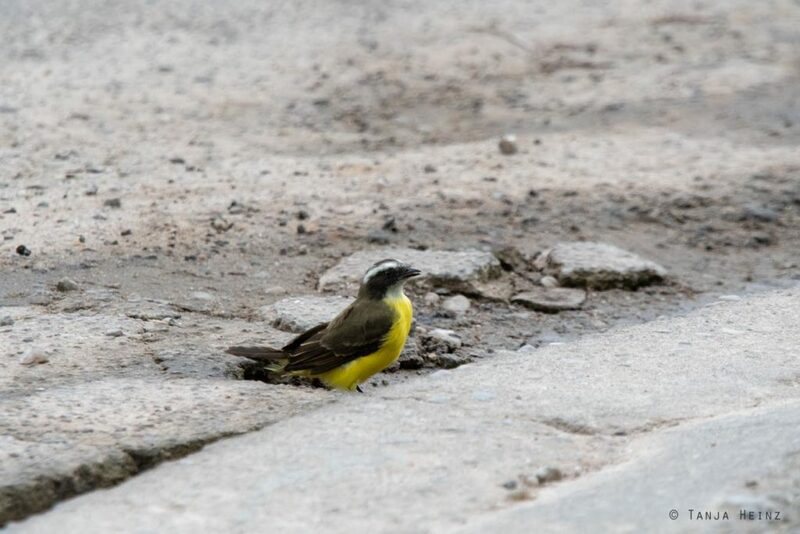 On another place in the quarter Itaguá we saw another tropical kingbird. Maybe it was the same bird? But this time it showed us just its back. Close to the tropical kingbird we also spotted some thrushes. 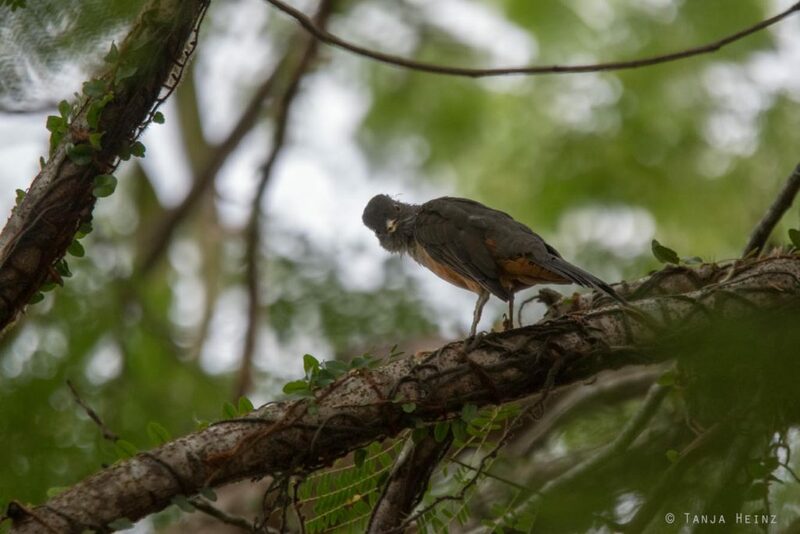 To be more precisely, we spotted a creamy-bellied thrush (Turdus amaurochalinus). And a red-bellied thrush (Turdus rufiventris). 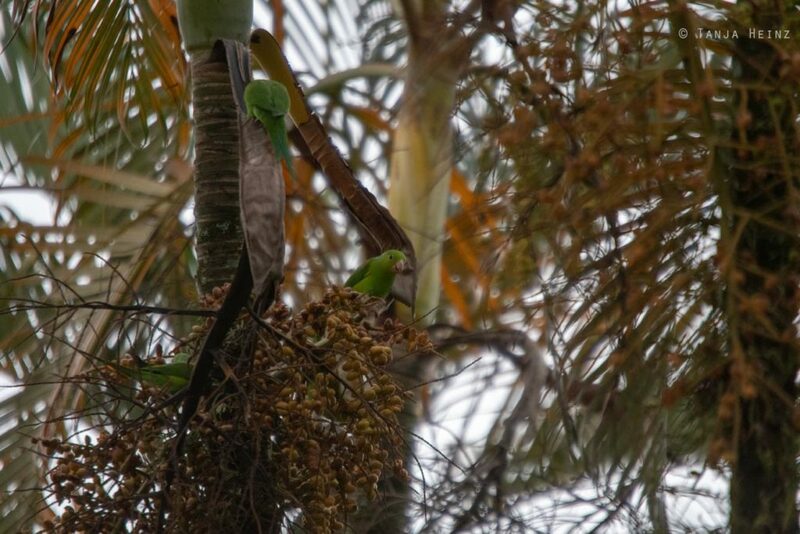 It became quite lively when a group of parrots – that means plain parakeets (Brotogeris tirica) – passed our way. Apparently they were searching for food. 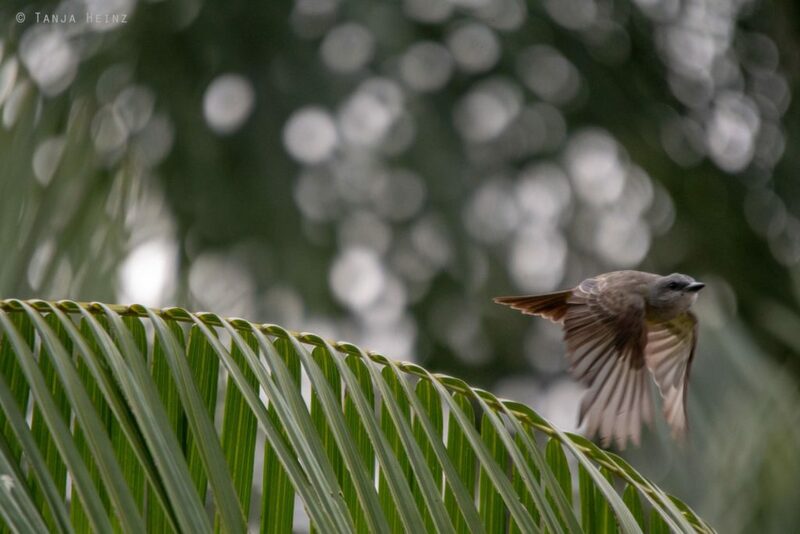 At first we saw one of them approaching a house where it perched on a palm leaf. 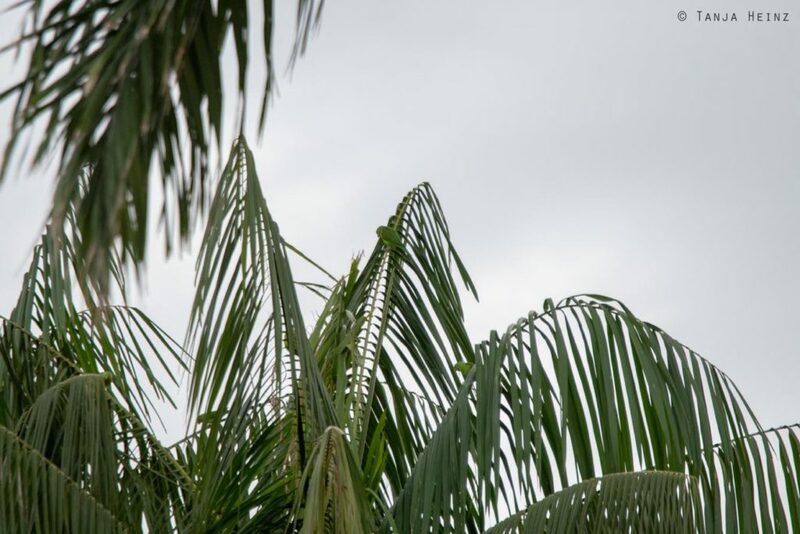 Then we spotted some more plain parakeets on another palm tree. We tried to follow them as inconspicuously as possible. 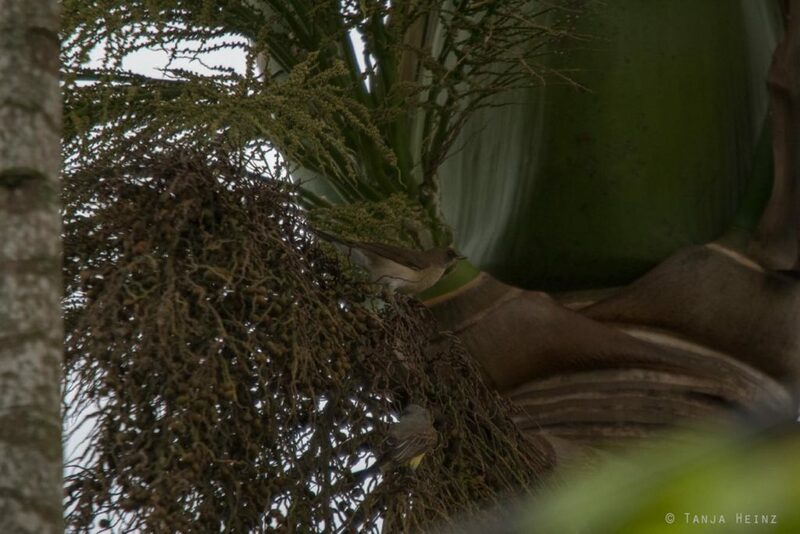 Finally they stopped at one palm tree where they were searching for food. Although parrots are rather shy birds, this group seemed to be quite tolerant and maybe accepted our presence. One of the plain parakeets was moving up the tree and looking for something to feed on. However, they apparently knew that we were observing them. One of them apparently wanted to tell us that it had seen us. Finally we left them behind and walked into the direction of the beach. In general we could not observe many birds close to the beach, but from the beach you get a great few onto the sea and the hilly landscape behind. The beach of the quarter Itaguá is not very big. Boats from this beach leave already early in the morning. We did not spot many birds at the beach, but there was one species I knew already from other places in Brazil. We spotted Southern lapwings (Vanellus chilensis). 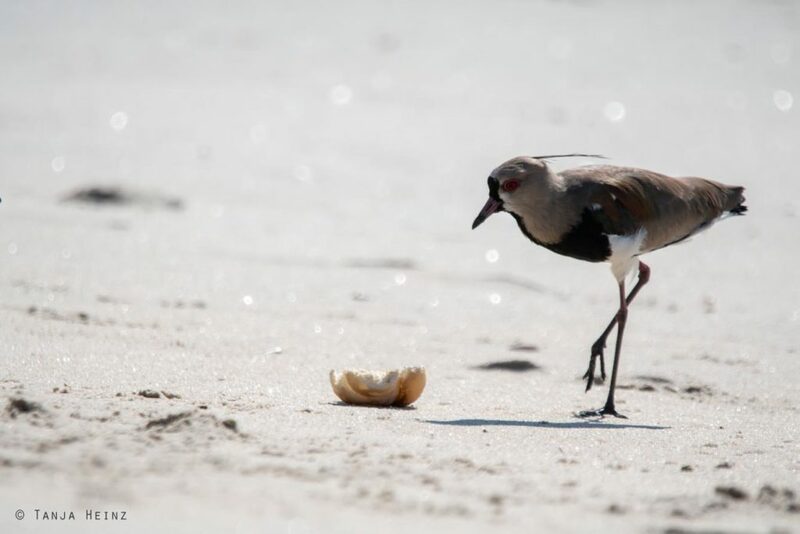 Some Southern lapwings found a piece of bread at the beach. We spotted them at the beach, but also at the tarred walkway along the beach. At the beach in the quarter Itaguá you also get a view onto Ponta Grossa where we had observed green turtles on another day. 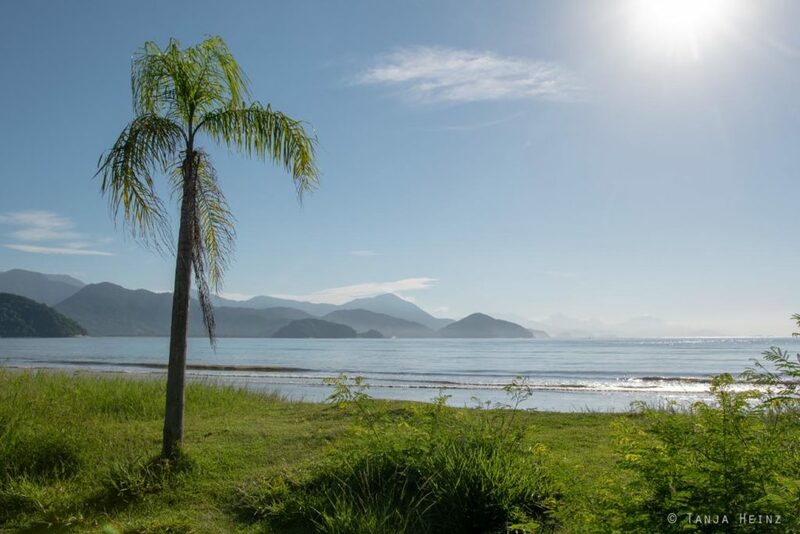 Beach in Ubatuba and view onto Ponta Grossa. During the day most boats are in the water. On one morning we went to the beach to observe sunrise. Especially fishing boats leave the beach early in the morning. 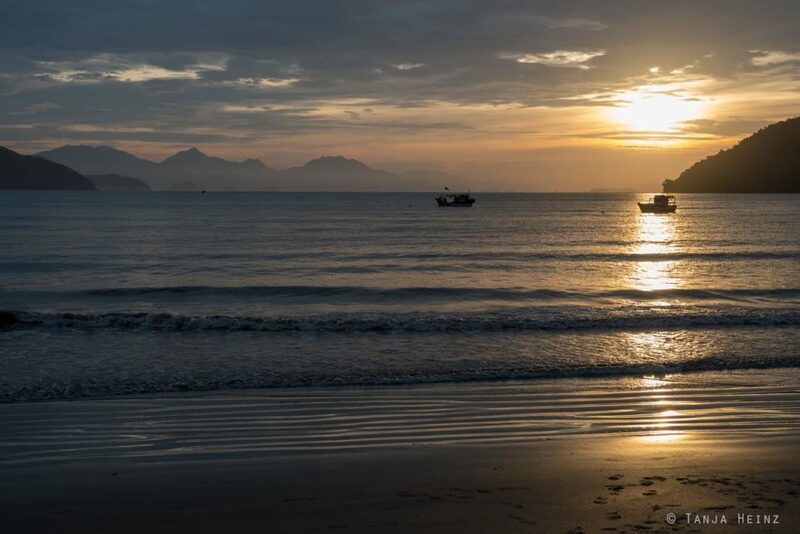 As you see, as much as we enjoyed bird watching, we used the time in Ubatuba also for other things like sun rises. 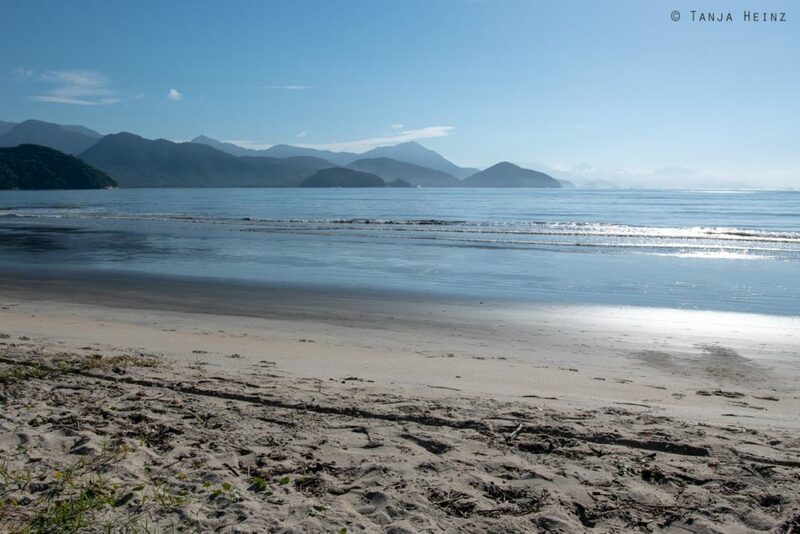 Ubatuba is a great and popular place if you are interested in bird watching in Brazil. 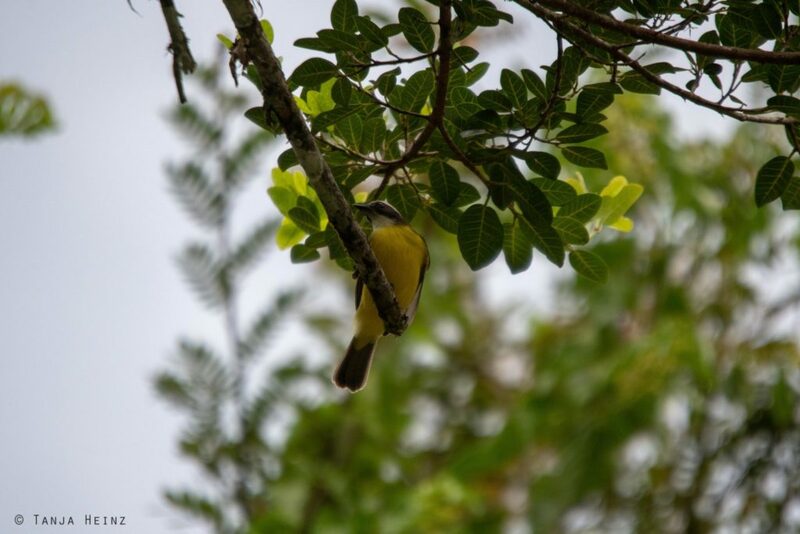 Tanagers, tyrant flycatcher, parrots or hummingbirds and many, many more birds can be found in Ubatuba itself in its surroundings. 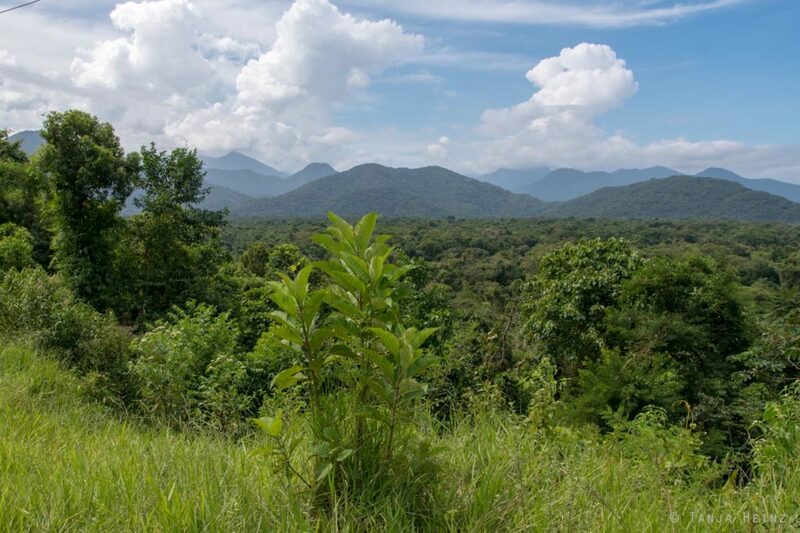 If you want to get the most of your bird watching experience, I recommend to leave the town early in the morning and search for birds in the surrounding forests. 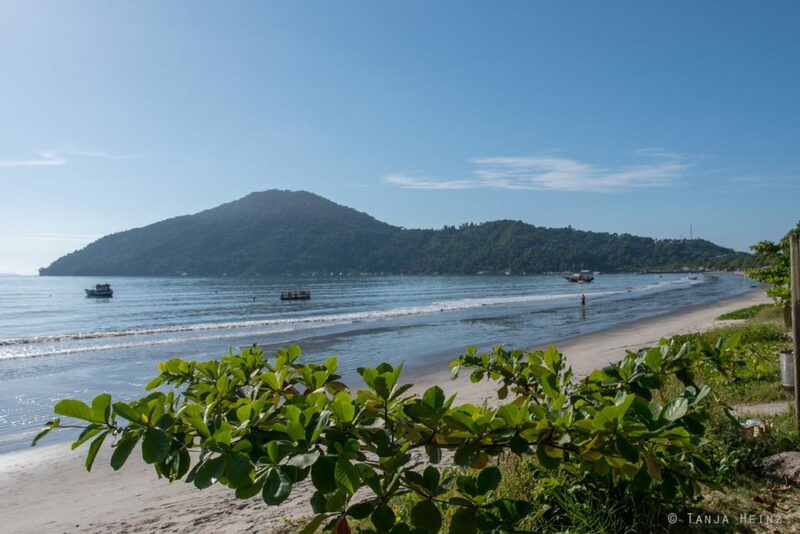 You can find more information about accommodation and arrival in my previous article about marine turtles and the Projeto TAMAR in Ubatuba.